Alice Project are opening a new month with the most adorable gacha set yet to hit our stores! From early October, we will be running Oh My Gacha! with 15 absolutely to-die-for-cute necklaces including 3 rare head gear. To play, simply pay the gacha machine L$50 and you will win one of the 15 prices, with Lady Fortune and randomness hopefully in your favor. If you’re lucky, you may just land one of the 3 rares! Will you go after the delicious happy cookie necklace? Or perhaps the sadface star? The chocolate donuts come with sprinkles to brighten your day and, if you’re fortunate, you might just land yourself a small plate of desserts complete with a signature cupcake to proudly crown your hairdo! Check out the poster to see all the possibilities, including the much-coveted rares! Play and collect the entire set, or trade your duplicates with other eager players today. DISCLAIMER: A gacha game is a purchase-to-play event that uses algorithms to choose and dispense a random product within the machine’s inventory. These items are no-copy but are transferable, and are therefore non-refundable once received. We will also not permit direct-purchase requests as this violates gacha event rules and also defeats the purpose of such an event. We hereby reserve the right to ignore all such requests as we choose. 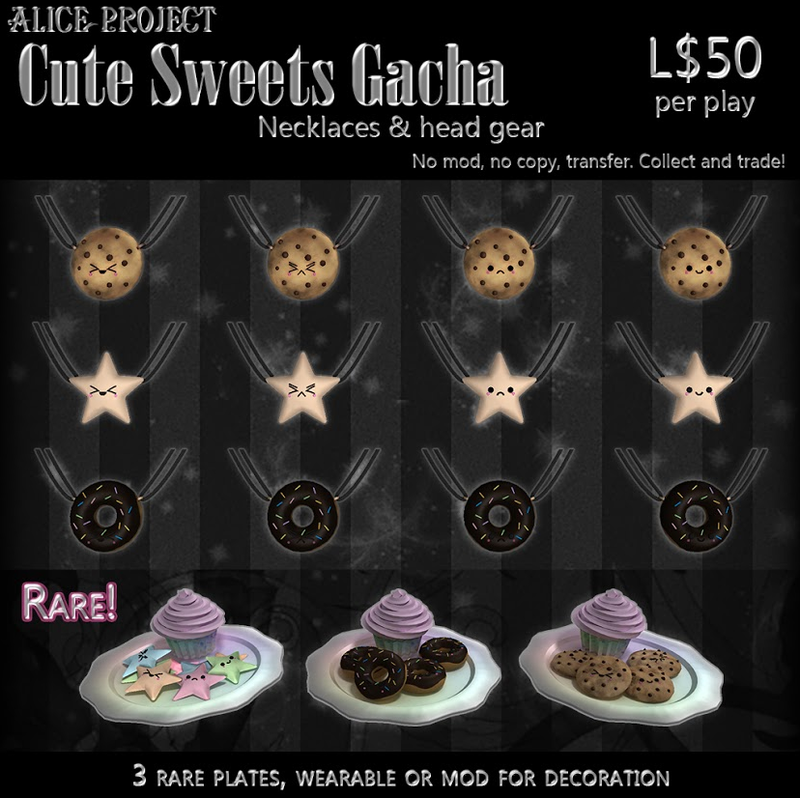 Alice Project permits and endorse the right of all gacha players to trade, sell, or dispose of all gacha items freely with no limitations beyond original point of sale at our machines.